Sarah Ruhl’s Stage Kiss now playing at the Lyric Stage is two plays within a play that centers on the problems that arise when former lovers are cast opposite each other in a revival of a 1930s melodrama, The Last Kiss, which is also about two former lovers. Make no mistake, this play is very funny. 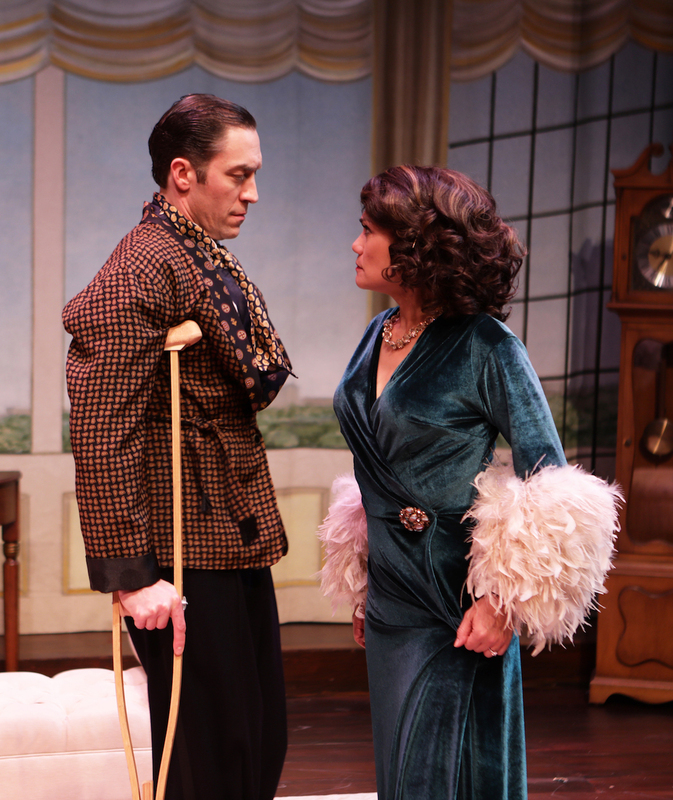 He (Alexander Platt) and She (Celeste Oliva) the former lovers who haven’t seen each other in over ten years are brought together when trying out for roles in a revival of a 1930s Noel Coward style play The Last Kiss. Sexual tension immediately arises as old passions become inflamed. She, who is now married and has a daughter while He is in a relationship with a woman from either Iowa or Illinois (you’ll understand when you see it), don’t take long to act on their desires. Make no mistake, this play is very funny. 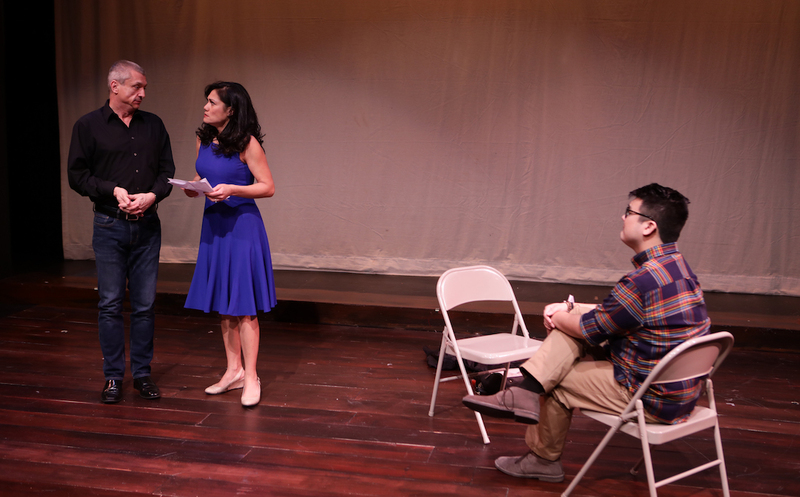 Ms Oliva, as She, is a positive riot as she reads for the part in front of director Adrian Schwalbach (Will McGarrahan). It is her first time trying out for a production in years and Oliva plays the part with a frenetic humor that conveys She’s self doubt. I couldn’t help but think this might not be much of an exaggeration of what many actors have been through. Mr. McGarrahan as Schwalbach is the perfect straight man. His timing is excellent as he knows just when to deliver a line or a look to allow the lines to sink in. I have seen him in a number of productions and he as yet to disappoint. He is played by Alexander Platt. He, shallow and self centered, lives just in the moment. He seems not at all concerned with the fact that She is married and has a child. At first this doesn’t seem important as the laughs keep coming and it is amazing to see the set for The Last Kiss come together as the action moves along. The play begins with an almost bare stage that evolves into a beautiful setting with lovely costumes. It is magical to see as it happens bit by bit while the lights are dimmed. Director Courtney O’Connor also plays a bit with the audience on when intermission is about to start. It is all fun and a nice touch. In Act II things begin to falter a bit. The Last Kiss has been a flop and now He and She are teaming up with Adrian in a new play he has written and is producing in Detroit. She has left her husband Harrison (Craig Matthers) and her daughter Angela (Theresa Nguyen) to be with He. He’s former girlfriend Laurie (Gillian Mackay-Smith) and Harrison have taken up with each other. Angela’s reaction to all of this is not hurt but anger that doesn’t seem all that real. She also seems quite self centered. And this is why things don’t quite work in the second act. While there are plenty of funny situations, we are still seeing a marriage torn apart and a child whose mother has walked out on her. I never got the sense anybody really was feeling much pain about all that had happened. Towards the end Craig Mathers gives a very moving and well done monologue about marriage that feels out of place as he appears to be the only one who grasps what has really happened. The lines he delivers include “Marriage is about repetition. Every night the sun goes down and the moon comes up and you have another chance to be good. Romance is not about repetition.” Beautiful words, and while She does go back with him, I don’t believe it is the words that have moved her. Her shallowness still rings through. Without an emotional investment in the characters it is hard to feel much even when listening to these lovely words so well delivered by Mr. Mathers. Now, I do have to say something here about Michael Hisamoto who plays a number of parts including the Kevin the understudy in The Last Kiss and a pimp in the play in Detroit. Mr. Hisamoto almost steals this production. He is positively hilarious in his scenes with Ms Oliva in Act 1. Their kissing scene is side splitting funny. Every time he steps onto the stage you can feel his energy. His presence is subtle but very strong. He can elicit laughter with just a sidewards glance. He is a very talented young actor and I hope we get to see more of him soon. 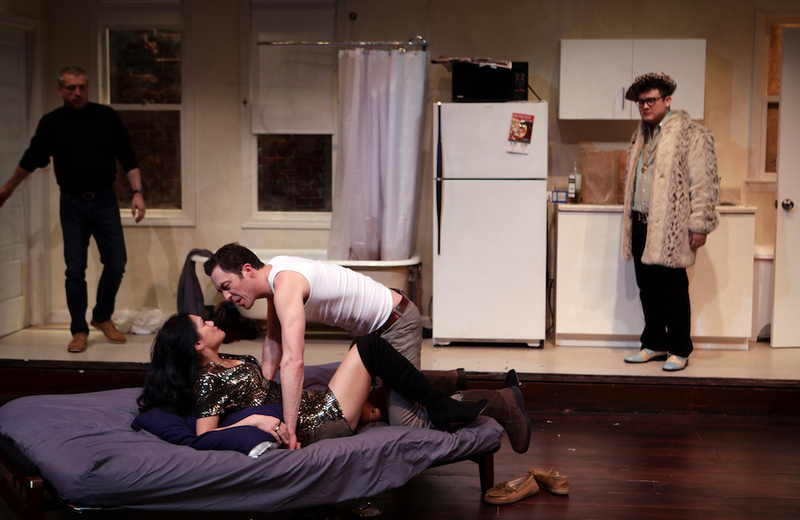 Stage Kiss may have some flaws, but it is still a production worth seeing. It is refreshing to sit in a theater and laugh. It is nice in this very heated political era to be able to step away from all the arguing and be able to escape for a couple of hours. Theatre plays many roles in our society. Some of it is political. But it is also important that it gives us a break from the anxieties that creep into our lives. Stage Kiss does that.